Elvis Enthusiasts Unite: I live the life I love and I love the life I live. Next week is sure a good week to be a music lover. If I am as ambitious as I think I might very well be, I'll make it to at least four shows by Friday night. It's a good thing next week wasn't this week, either, cause I had one of those Mondays that I thought was the following Monday instead of the one it actually was. Confused? I was, too. The rest of this will be easy to understand. Follow along with your hearts to guide. Monday: Blind Pilot out of Oregon will playing over yonder at Urban Lounge. Much has been made of the fact Laura Gibson is opening (who will also be doing an earlier show at Slowtrain for FREE), but she doesn't grab me like she probably should. That's okay, too, cause Blind Pilot is the band that really knocks me out. They're the ones who recorded demos in a warehouse. They're the ones who saved gas by doing a bike tour to pimp out their EPs. But that backstory doesn't much matter. What does is that their album just knocks me flat. It's the best brand of ear candy I've tasted in a long while. And it only gets better and better and better. I wonder if they're that great live. I have high, high hopes for this. I will not miss this show. Tuesday: Eh, I got nothing. Wednesday: Super secret Peter & The Wolf show. As in even I don't know where it'll be exactly! Lots of dancing involved on this one. Come prepared to shake it. Not your usual acoustic meanderings, no sirreebob! He's still working 14-hour days to finish this album before he clears out of California but, even if he doesn't get it done before Wednesday, he'll be unveiling an all new brand of music, something he likens to Flight of the Conchords. Yes, those Conchords. UPDATE: This show will go down at The Woodshed, 60 E. 800 South. 8:30 PM sharp. Be there, yeah? Friday: More Portland love. Blitzen Trapper, along with Alela Diane. I love this band. Like a countrifed Shins they are. And can you go wrong with that sound? Not so much. It's comfortable enough to settle down into real nice like, too; after an entire week of music, this is a good smattering of notes to end on. So, you know, come to these shows. Be my music-loving friends. We will bob our heads and tap our bare feet and sweat some and smile more and appreciate these songs like they're our food and we need them to stay alive in these crazy economic-poor times. I'm still trying to decide if I should skip studying for a different test on Monday, and catch Blind Pilot after work. hey, i have an idear. i'll see all of those same bands, one day later. deal? Tuesday: ...And You Will Know Us By the Trail of Dead @ Urban. Friday: Future of the Ghost, Starfucker, Patterstats @ Kilby. it would be very ambitious... like hell week in high school. only the strong make it through the whole week. I have enough love for Laura Gibson for the both of us. I happened to catch her about a year ago during the stop she made at Slowtrain on her way back to Portland, fell in love with her music, and walked out of there with her album. I've been listening to it since. Needless to say, I pre-ordered her newest album and got a FREE ticket to the Urban show with it! Score. p.s. I hope you've been enjoying that Swell Season Live goodness since it graced your presence. Come, come and take the new round of fantastic shots. It's your density. Oh! What great shows! and Blitzen Trapper! I love them! Hey, at the risk of showing my ignorance to this crowd of small unknown indie bandologists...I don't know any of the bands you mentioned...but, in that pic you have up there is my old roommate Jessica and her husbund Cameron. Where was that? Wait...I looked a bit closer...is that Loralee's old place? Sure was. And it was taken at a Peter & The Wolf show, hmm, at least a couple years ago now. And, while you might know any of 'em, just clickety-click on some of the links and get an earful. Some of them are really rather amazing. You just might like. Blind Pilot has been on heavy rotation for a week now, in fact they are currently drowning out the clickity clack of the office. 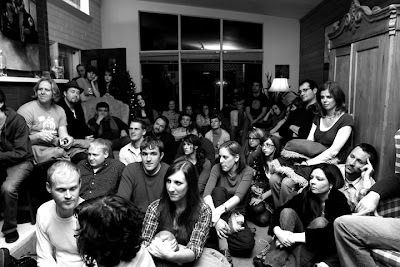 would love the info on the Thurs house concert--please send to mommymich@hotmail.com--thanks! I'm listening to NPR's All Songs Considered, and I made a resolution to go to SXSW next year. Seriously, we should get a group together and go next year. I will go with you Sherpa!